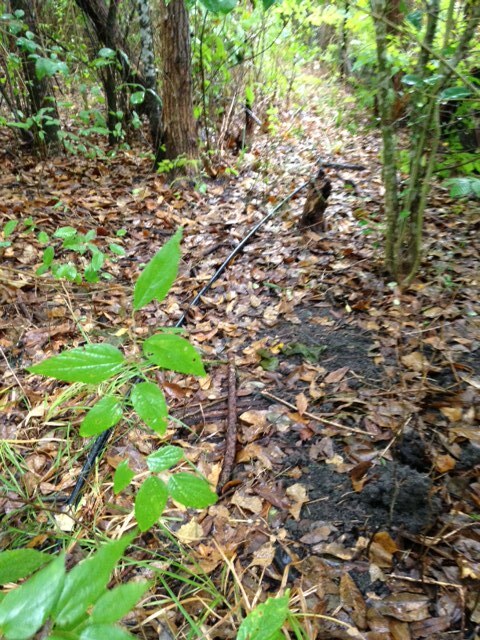 A week ago Comcast returned to bury the “buried” cable line. This escapade began on July 24 when I was eagerly signed up for internet service. After much discussion and consultation, the “super-supervisors” agreed that buying the cable would be very difficult and that the line would be strung using our current power lines. Parts of the stringing would be difficult, but I agreed to clear a lot of tree branches from around the lines. This was something I should have done a while ago. The aerial crew was to show up the following day. The crew showed and immediately said it would be impossible to string the wire. They wanted another crew to show up and bury the wire. I simply said they needed to work this out with their “super-supervisor.” After much gnashing of teeth and delay, they set to work. The crew did a great job and everything works! Like everyone with cable internet, there are isolated, short, spotty slow-downs with service. But, I can finally work efficiently from home. It has been nice to have bandwidth that rivals the lower half of internet speed in the world. The lesson that I have learned in dealing with a large corporation with lots of subcontractors is that social media is valuable. My complaining on Twitter was picked up. It put me ahead of the queue for people who have relied on the usual phone-tree approach. Why social media should be so powerful in getting a response is puzzling. My sense is that consumer dissatisfaction is far more widespread than what appears on social media. Fixing the problem by having employees cruise social media is like sticking a finger in a leaking dike. The good news is that I now have service. I can finally vent about lousy service when it happens. So far I have nothing to complain about. This entry was posted in Uncategorized and tagged Comcast, internet, lousy service on September 12, 2014 by rkwrice. Earlier this summer I was asked by Jennifer Diascro at the American Political Science Association to attend one of the pre-conference mini courses. The course was on “Educating Congress: Translating academic scholarship into public scholarship.” I was attending APSA anyway and this is a topic that interests me. I’ve complained in a number of settings that we (political science) are part of the problem. Our research is first rate, important, but lost because it is not translated into the public domain. It is especially lost on those in positions of authority who authorize and oversee the money we get through grants. I attended the course and I learned a great deal. I’ll share some of what I learned. APSA commissioned the Graduate School of Political Management to put together the mini-course. Lara Brown from the GSPM put together a nice program of former Members of Congress (MoC), current staffers from the Hill, lobbyists and faculty from GSPM. The format was such that interaction from the audience was encouraged (or else I am not shy about interjecting and kept it up throughout the day). So what did I learn? The Hill is a small place and the flow of messages overwhelms MoCs and staffers alike. We all believe that our message is extremely important. If it is well argued and/or presented, it will resonate. We believe this is true with our students, a group that should be motivated to be attentive, and we are always shocked when we grade their exams. Why should we expect our message, no matter how well crafted, to attract attention? We are competing with millions of other messages. Leaving it to a white paper, a one-pager, a reprint of our article or an Op-Ed piece is simply not going to be sufficient. My message is competing for attention. I better figure out how to get it to stand out. And I better not depend on it to matter. When crafting a message, consider the receiver. Staffers are like our students. They are a bit older, but most have just finished college. What do they read? Where are they likely to get their information? Many are consuming information in small bites. A friend points them to a piece in the Drudge Report or the Huffington Post. Social media is important, but we’re not part of their network. Write for your audience. MoCs may read differently, but they are so crunched for time it is unlikely they are going to want to read some long and dense. This is especially true if the topic is far removed from their own interests. Establish a relationship. This may seem like cronyism or impossible. But it is possible and you are not trying to become a MoCs BFF. We all teach and for those of us who are political scientists, we teach politics. Ask your MoC to teach one day in your class. If it goes well, invite him/her to teach in your class each semester. If you’re lucky, like me, you may have 8 MoCs in your city. Spread them around. MoCs might be flattered to teach at your prestigious institution. Help arrange a press release with the local staff. They’re in their district, they’ll be comfortable, and you’ll have a bit of time with them. Even if you don’t teach American politics, figure out if your MoC has a committee specialty that can link with you class. Do they deal with foreign affairs or defense? Do they have special interests in trade? Somehow you can make the link to something you are teaching and whatever the MoC says can be treated as a case study for the theoretical point you want to make. What if the MoC is too busy? Get one of the local staffers to substitute. They’ll have insights too and it will never hurt to cultivate that relationship. Be nice. When you contact your MoC, of course you will not get through. The role of staffers is to protect the time of their MoC. Use lesson 3 when dealing with staffers at all levels. Cultivate a relationship with each of them. Be nice to all of them. You have no idea who is going to control access. You have no idea which staffer may eventually become a key ally. There is going to be an enormous amount of turnover among the staff. They get burned out and they are not well paid. But you have no idea who will help you out. Thank them and follow up. Treat them the same way you should treat your Department staff. Everyone is important. In descending order, what resources are used by staffers working on behalf of their MoC? Internet searches (just like your students, it’s the first place they go). Congressional Research Service (CRS). This is the research arm of Congress. Relevant Federal agencies. They report information all the time. Note the problem with this list. Your PhD is not going to help. There is a lot of information out there (lesson 1) and staffers are not going to reach out to consult with you. There are a lot of other sources to consult before getting to you. If you can figure out how to get you work to be the top hit on Google, great. Otherwise your piece of advice is likely not going to register on the first 50 page of hits. If you have something to add to the issue you find important, you might cultivate the appropriate researchers at CRS. Use your own students. Many of us have taught students who have gone on the the Hill. Reconnect if possible. Cultivate that relationship. Bring them back to the Department, if you can, and have them talk to your current batch of majors. Build on the relationship. Avoid the “ask” (at first). Most of us don’t want to lobby a MoC or staffer for something tangible. I would simply like people on the Hill to take social science seriously. In initial meeting, decide what you want to say and stick with it. As with most early relationships, it may be little more than establishing commonalities. Make your point, when you speak with someone on the Hill, in their language. Rather than talk about efficiency, talk about tax savings. Rather than talk about institutional structure and mobilization, talk democracy. It’s a matter of knowing your audience. Don’t get trapped in defending what you do. While I rail constantly that political science is rigorous and systematic (and not idle opinion), this is not a fight I want to get into when dealing with someone on the Hill. I believe I learned a lot more than this. But, I’ll save it for future posts. I was pleased with the APSA for putting on this program. I was less pleased by the very low turnout. I was the only senior political scientist from an academic institution. There were a number of advanced graduate students and that made me feel good about the future of the discipline. However, it is up to all of us to begin educating Congress of our value. This entry was posted in Uncategorized on September 1, 2014 by rkwrice. It has been interesting to experience how social media gets a response from a large corporation. By contrast to dealing with live employees on the telephone, using social media gets a response. In my last post, I was frustrated by repeatedly calling, making appointments and being dropped and discarded. Blogging, posting on Facebook and tweeting got the attention of Comcast. I was upgraded to “executive” status, asked to email a special problem solving group and assigned a caseworker. Very promising. My email was answered in short order and I was asked to call my super agent. I did, I left my message and was promised that my call would be returned. There was no reply. August 15 went by (okay, a Friday and everyone would like to have time off). Monday the 18th I tried calling again and left multiple messages. No reply. By the end of the day, I discovered that my DSL was briefly working, so I fired off an email to my “super-duper” agent and copied the “executive status” email complaining about the inactivity. Much to my surprise my agent awoke from deep in the belly of the Comcast machine and responded. Also to my surprise the message was about refining the selection of programs that I had ordered. I had no service, I wanted no programming and I only wanted to arrange an appointment so that some cable could be strung to my house. I puzzled about the message and the next time my failing DSL appeared (I suspect that AT&T was intercepting my messages to Comcast and was trying to prevent me from dropping my barely functioning DSL service – okay, maybe that’s overly paranoid) I sent another email indicating that I was asking for something simple. A stream of emails ensued, with the gist of the matter being that my account was confused with another account. My super-duper agent would dispatch someone to scout the location to determine if an aerial cable could be installed. I had reminded super-duper that someone would have to be present to let the technician onto the property. The technician showed and left, without ever getting onto the property! Arghhh. Back to where I started. A phone call. An area supervisor was going to show the following morning. Could we let him on the property. With tears of joy in my eyes I said yes! The supervisor arrived on time and quickly looked around the property. We were going to have to have a heavy cable installed and all the trees along the lines were going to make it difficult. A crew was assigned for the following morning. This gave me the chance to trim trees along the power line and make certain that there would be fewer problems for the crew. As the afternoon faded, the DSL came magically to life, working better than it had in months. The crew appeared! After much discussion it was deemed impossible to do an aerial cable. A buried cable it would have to be. How this would be accomplished was a bit vague. The crew didn’t have the right equipment for digging. My heart sank. Part of the crew turned their attention to the inside of the house. Obstensively they were preparing us for eventual service. The tech guys were really helpful and worked out some kinks in our wiring. Fortunately there was nothing they had to wire and that part of the installation went smoothly. I was asked to hook up my laptop and I had service! The other half of the crew figured out a route for the cable, uncoiled it, laid it on the ground, made the connection and life was good. Smiles all around and the crew, after wondering why this had taken so long and being treated to an abbreviated version of the story asked that we didn’t take it out on them when called later to take a short survey. With a Friday installation, we were promised that the line would be buried on Monday when the crew arrived with the proper equipment. We reveled in having an internet connection. Hooking up my old Apple Time Capsule took a few minutes, but went smoothly. We have a nice wireless system with enough speed to stream video. A miracle. Two guys appear to bury the cable. The “special” equipment is a broad, flat shovel. The soil is rock hard given that we have had no rain. I’m skeptical and I follow where the cable has been laid out. Part of the way is through some dense brush, so I work ahead and clear a path. I head back into the house to work and I’m surprised that a short time later they tell me they’re done. Great and thanks! The connection is still working. Later in the day I go out to take a look. The cable is half buried. A huge coil is left above ground. While we rarely mow down this fence line, clearly this is going to be a problem in the future. The supervisor calls to check on the completion of the job. He is pleased that we have service. He’s surprised that the cable is not buried. He wants to schedule a time the following day, but I tell him I will be out of town. He promises to get the crew back out to finish the job late in the afternoon. 8:00pm. The crew shows. It is deep dusk and growing darker by the minute. They’re going to cut the excess wire, reconnect and finish burying the cable. I tell them it is too dark, but they say it is no problem. I return to eating my dinner, but Therese convinces me this is a bad idea. I can see the cut cable in my mind and having service permanently severed. I hurry back out and ask them what they plan on doing. I’m assured that the cut will only take a minute and they can quickly reset service. They insist they only have 10 feet of cable to bury. I point out they still have another 75 feet that has to be buried. Oops. Caught. I tell them to forget it – this can be done at another time. We’ll see what happens. We’re not out of the woods yet. The installation needs to be completed before we can join the hoards in complaining about the quality of the service.